The paper was an evening paper until September 1, 2006, published weekday evenings and Sunday mornings. It then switched to a morning paper, published daily except Mondays. In 2015, Gannett acquired full ownership of the Texas-New Mexico Newspapers Partnership. Alamogordo Daily News is primarily a local newspaper. It has a staff of reporters and news editor to write local news. It also carries state, local, and national news from the Associated Press. It covers the city of Alamogordo and the neighboring village of Tularosa. The other incorporated area in Otero County, Cloudcroft, has its own newspaper, the Mountain Monthly, and does not get much coverage in this paper. The paper publishes and shares some content with a free weekly tabloid, Hollogram, at nearby Holloman Air Force Base covering happenings on base. The Opinion page combines editorials, editorial cartoons, op-ed pieces, letters to the editor, and occasionally short feature articles written by community members. "Celebrate" features wedding announcements, anniversaries, promotions, etc. There are regular columns on gardening, on Alamogordo Public Schools, on Alamogordo Public Library, on animals in the Alameda Park Zoo, and on Otero County Community Health Council. "New Mexico Tally", a roll call from Thomas Voting Reports of how New Mexico's Congressional delegation voted on the most important bills, appears each Saturday. The paper's web site carries all the locally-written editorial content. It is updated once or twice daily with breaking news stories that will appear in tomorrow's print edition. There is also an official newspaper blog. The paper runs a lead editorial in each issue, but they are nearly all reprinted from other newspapers, particularly other MediaNews Group papers. There is no editorial cartoonist, but each issue carries an editorial cartoon from the Copley News Service. The syndicated columnist Jay Miller from Santa Fe appears frequently with his "Inside the Capitol" column about New Mexico politics. ^ "MediaNews Group Paid Circulation" (PDF). MediaNews Group. 2007-03-31. Archived from the original (PDF) on June 25, 2007. Retrieved 2008-05-27. ^ Townsend, David; Clif McDonald (July 1999) . Centennial: Where the Old West Meets the New Frontier. Alamogordo, NM: Alamogordo/Otero County Centennial Celebration. ISBN 978-1-887045-05-6. OCLC 41400788. ^ Harwell, June (2000). Alamogordo Public Library: A Community Treasure, 1900-2000. Pioneer. 3 no. 1. Alamogordo, NM: Tularosa Basin Historical Society. OCLC 45084643. ^ Santo, Jamie; Kathryn Wade (2001-07-30). "Daily Newspaper Sales, January-June 2001". Editor & Publisher: 11. ISSN 0013-094X. OCLC 1567511. ^ "Gannett, MediaNews Group expand and reorganize Texas-New Mexico Partnership" (Press release). 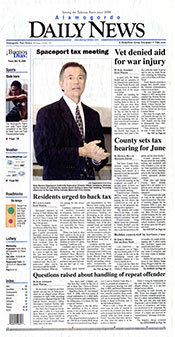 Gannett Co., Inc. 2005-12-01. Archived from the original on 2007-04-02. Retrieved 2008-05-28. ^ Coltharp, Richard (2006-09-13). "To err is all too human". Alamogordo Daily News. OCLC 10674593. ^ "2006-2007 NMPA Better Newspaper Contest Winners List" (PDF). New Mexico Press Association. Archived from the original (PDF) on 2009-03-25. Retrieved 2008-05-28. ^ "Daily News endorsements". Alamogordo Daily News. 2008-03-02. pp. 4A. OCLC 10674593. ^ "Daily News endorsements for the Nov. 7 election". Alamogordo Daily News. 2006-11-02. pp. 4A. OCLC 10674593. ^ Stevens, Jeff (2007-03-04). "No more smoke-filled back rooms? What gives? (Bitter Medicine)". Alamogordo Daily News. pp. 5A. OCLC 10674593. ^ Coltharp, Richard (2007-03-08). "Smoke gets in your eyes (Going Downtown)". Alamogordo Daily News. pp. 4A. OCLC 10674593.